As a follow-on to last week's article on Shipping Methods and Types, here, explained in excruciating detail, is GP sales tax calculation logic. When the system calculates tax on a sale or purchase transaction, it compares the tax schedule assigned to the customer or vendor, as well as the tax schedule assigned to the sale or purchase transaction and any freight and miscellaneous charges. The system checks for details that match between the customer or vendor and the sale or purchase amounts. Taxes are calculated only for the details that match. When calculating sales tax on either sales transactions or purchase transactions, GP relies on the Shipping Method to determine the sales tax rate applied to the transaction. 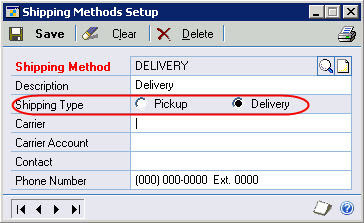 Key to determining the tax rate used is the Shipping Type selected in Shipping Methods Setup. 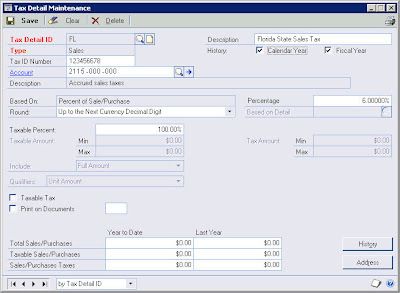 .net 3.5 sp 1 Year End tax forms OK! I'm happy to report that after all of the issues that came up during the SP 4 year end update and .net 3.5 sp 1, the Forms W-2 and 1099 printed perfectly. This is a quick re working of the advice we put together last time the VAT changed from 17.5 to 15%. This change is being reversed in January 2010 so now would be a good time to start thinking about how this might effect your systems. The changes in VAT where originally set out in the Chancellors PBR on the 24th November 2008. Because of the nature of Tax calculations in Dynamics (GP) this article is intended purely as a Guide and you will need to choose the appropriate actions for your circumstances. Originally we advised that everyone will need to set up a new set of tax details to replace the 17.5% details currently used. We recommended that you did not simply change the rate on your existing detail as this could cause you reporting problems and issues when trying to post back. You needed to set up a minimum of two details, one for sales and one for purchasing. This needed to be done in each of your companies. If you followed this advice you should now still have your original 17.5% tax codes to which you can now revert in January.